Dr. Lutz utilizes a patient-centered approach which incorporates his extensive training in chiropractic, rehabilitation and sports performance to quickly decrease pain associated with back pain, without the use of drugs or surgery. Back pain is the most common complaint we treat. More than 80 percent of Americans experience lower back pain at some point in their lifetime. For many, the effects of low back pain are an everyday battle which immensely impacts the quality of life. The pain we feel — whether in the back, the hips, or down the legs — is the body’s request for change. Back pain is not an indication something is broken or that it needs to be “fixed”. At Motion ChiroTherapy, we take the time to understand the issue and how it behaves in order to apply the right tool for the job from our unique toolkit – only then can we achieve a solution. What Causes Back Pain and How is it Treated? Back pain is most commonly mechanical in nature, meaning the issue is based in movement, and how we’re using our body. If your back pain changes — becoming better or worse — with different positions and movements, you likely suffer from mechanical back pain. Because the nerve supply to your legs stems from the spinal cord within the spine, poor spinal mechanics can alter the signals from your brain to the muscles. It is common to experience symptoms such as pain, muscle weakness, or numbness and tingling into the hip or groin, down your legs, with or without local back symptoms! In quality non-surgical care, it’s important to minimize variables and rule out the spine as the pain generator. Many medical diagnoses need to be thoroughly examined so that we don’t “chase pain” and can understand WHY you’re dealing with discomfort. Approximately 13% of low back pain is attributable to the SIJ (3). Sacroiliac joint dysfunction (SIJD) can be divided into two general categories: mechanical and arthritic. “Mechanical” SIJD results from any process that alters normal joint mechanics. Common culprits include: leg length inequalities, gait abnormalities, lower extremity joint pain, pes planus, improper shoes, scoliosis, prior lumbar fusion, lumbopelvic myofascial dysfunction, repetitive strenuous activity and trauma – especially a fall onto the buttocks. Studies show that over half of mechanical SIJD results from an inciting injury (4). Pregnancy creates an array of sacroiliac joint issues with weight gain, gait changes and postural stressors occurring contemporaneously with hormone-induced ligamentous laxity. “Arthritic” SIJD results from either osteoarthritis or from an inflammatory arthropathy including; ankylosing spondylitis, psoriatic arthritis, enteropathic arthritis, and Reiter’s/reactive arthritis which produce sacroiliitis and resulting pain. Morning pain that resolves with exercise is characteristic of arthritic SIJD. The clinical presentation of SIJD is quite variable and shares several common characteristics with other lumbar and hip problems.The patients’ lumbar spine must first be ruled out as the pain generator since it’s a common referral for low back discomfort. When asked to point specifically to the site of pain, the SIJD patient will often place their index finger over the posterior superior iliac spine (PSIS). Pain may or may not refer to the lower back, buttock, thigh or rarely into the lower leg via chemical radiculopathy of the neighboring L5 or S1 nerve roots (5). Symptoms may be exacerbated by bearing weight on the affected side and relieved by shifting weight to the unaffected leg. Pain may be provoked by arising from a seated position, long car rides, transferring in and out of a vehicle, rolling from side to side in bed or by flexing forward while standing. Pain is often worse while standing or walking and relieved by lying down. Iliotibial band syndrome (aka Iliotibial Band Friction Syndrome) describes an irritation of the tissues near the distal attachment of the iliotibial band. This overuse syndrome is particularly common in runners and cyclists. The typical presentation for ITB syndrome is a runner or cyclist complaining of “sharp” or “burning” pain aon the outside of the knee – near the lateral femoral condyle. (9) Pain may radiate slightly above or below. (9) Symptoms are provoked by activities that require repetitive knee flexion and extension. Symptoms are more likely as activities proceed. (9) Less severe presentations may report pain only during activity, but as the condition progresses, symptoms become more persistent. Our chiropractor in the FishHawk, Valrico and Riverview area typically finds that sciatica symptoms aren’t always as black and white as it’s drawn up in the books. The patient typically can’t draw a straight line with a pen from the back straight down the leg. Rather, the symptoms are variable and change based on positions and movements. The patient may sometimes have pain the glute, their hamstrings feel “different” and they have an odd sensation in the calf. Sciatic pain can vary from intermittent and irritating to constant and debilitating. Symptoms are usually based on the location of the pinched nerve. 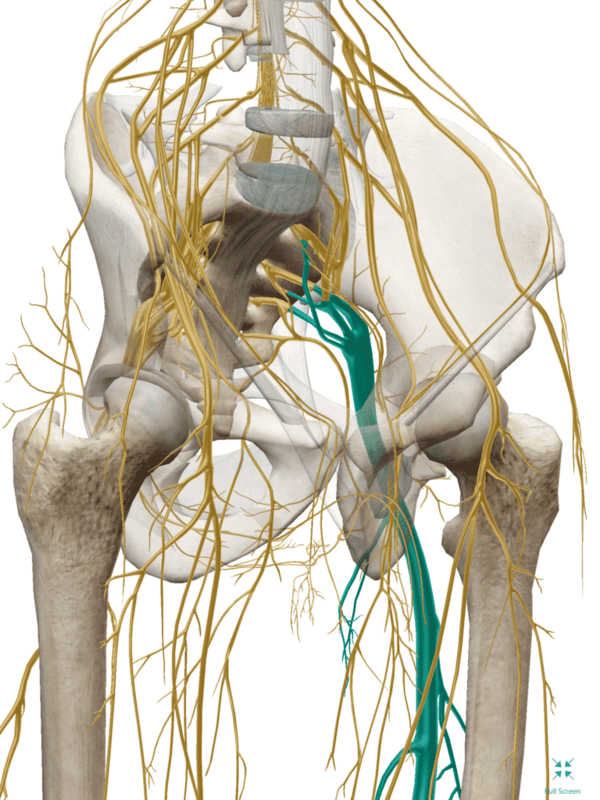 The sciatic nerve is the largest single nerve in the body and is made up of individual nerve roots that start by branching out from the spine in the lower back and then combine to form the “sciatic nerve.” Sciatica symptoms occur when the large sciatic nerve is irritated or compressed at or near its point of origin. The sciatic nerve starts in the low back, typically at the third lumbar segment. At each level of the lower spine, a nerve root exits from the inside of the spinal canal, and each of these respective nerve roots then come together to form the large sciatic nerve. The sciatic nerve runs from the lower back, through the buttock, and down the back of each leg. Portions of the sciatic nerve then branch out in each leg to innervate certain parts of the leg—the thigh, calf, foot, and toes. The specific sciatica symptoms—the leg pain, numbness, tingling, weakness, and possibly symptoms that radiate into the foot—largely depend on where the nerve is pinched. Often, a particular event or injury does not cause sciatica— the most common cause of sciatica is “for no apparent reason” – it tends to develop over time. Our chiropractor in the FishHawk, Valrico and Riverview area helps you understand your sciatica symptoms and will quickly find you a solution or get you to the provider who can help. In rare cases, back pain can indicate a serious medical problem requiring immediate attention. Our thorough history and exam will help guide us if we need to send you out immediately. Please be cautious if you’re dealing with signs like: bladder dysfunction, fever, direct trauma or unexplained weight loss accompanied by back pain. Let’s talk about pain science! Pain is a signal from the brain of a perceived threat. Pain is there to protect you! It’s a request from our brain telling us that it’s time to change something – whether that’s the way you move, positions you live in or what you’re eating. Mechanical back pain does not have to be debilitating and just because you have back pain does not mean you’re broken. Just because you have pain doesn’t mean you need an MRI; just because your MRI shows “degenerative,” “disc bulges,” or “arthritis,” – doesn’t mean it’s causing your pain. Back pain is often unassociated with the aforementioned structural changes commonly found from imaging, e.g. X-ray, CT scan, MRI. There are countless studies that show arthritis, disc bulges, and hip pathology on individuals who don’t have any pain! Humans are meant to move and move often — not sit in chairs and stare at electronic screens for hours on end. From infancy through the first year of life, we learn to how to move properly; setting us up for the rest of our lives. Think about the average desk worker’s day: sit for breakfast, sit in the car on the way to work, sit at the desk, sit for lunch, back to sitting at the desk, sit in the car back home, sit in front of the T.V. — you get the point. Mechanical back pain can occur suddenly from something as simple as bending over to put on your socks, but most commonly occurs for no apparent reason – likely from accumulated stress. The accumulative postural stress of sitting as a daily habit is like bending your finger backward. It may not hurt at first, but the longer you hold it there, and the more pressure you apply over time, it will start to feel uncomfortable and aching. When you let go of the finger, you’ll have a residual ache, but you’ll notice the pain quickly subsides. This is mechanical pain and is similar to what the typical American with back pain experiences. So, what happens after you poorly lift something heavy after sitting all day? It’s like cranking that finger back as far as it can go…and it’s probably going to hurt long after you let go of it! The most common treatments are rest, medication, physical therapy, sports therapy, chiropractic, acupuncture, massage, and other various conservative therapies. While most acute bouts of back pain will resolve on their own within a few weeks, the risk of recurrence is very high. This sounds silly, but the greatest risk of lower back pain is previous low back pain — if you’ve had it once, it’s likely going to happen again. The goal is to learn proactive strategies so that if you deal with the pain in the future not only can you manage it, but attack and relieve it on your own. Few individuals need surgery for back pain. Do you have a disc bulge? Even if it’s relevant, lumbar disc herniations have been shown to resolve on their own without surgery. If you have intense and unrelenting pain down the leg, progressive muscle weakness, bladder or bowel symptoms, or specific structural problems not responding to conservative therapy, surgery may be warranted. Low Back pain is a $600 billion dollar industry in this country. That is outrageous! Musculoskeletal pain is unfortunately very mismanaged. Why make simple problems complex? With all mechanical pain, there’s a ‘what’ and a ‘why’ — what the problem is and why it’s occurring in the first place. To achieve resolution it’s crucial to not only identify and correct the problem at hand but address the behaviors which lead to the issue! Avoid sitting for longer than 30-minutes at a time. Take micro-breaks: stretch, take a stroll, grab a snack, move around. Take mental notes of what you are doing when your pain feels better or worse to identify any positional patterns. Still Struggling With Back Pain? We Can Help! Many traditional clinics focus on long-term treatments that require extensive in-office appointments costing patients both time and money. At Motion ChiroTherapy, we provide a cost-effective alternative. We quickly identify what’s causing your discomfort, get you out of pain, then teach you how to minimize any recurrence through specific exercises and principles. To achieve rapid results, Dr. Robert Lutz takes his time to talk to you and learn about your problem, analyze your movements and uncover the root cause of each individual complaint. Once the source of discomfort is detected, we will use the most appropriate treatments from our unique toolbox to quickly resolve symptoms. We understand what patients want; fast pain relief, personal attention and the ability to get back in motion!